We are always looking for amazing concepts to share with our clients as options for their wedding signature drink. We have done quite a few Peach Mules (a must when you’re doing weddings in Georgia! ), but these new twists on the classic from some of Miami’s hottest restaurants have got us intrigued! Stephen Starr’s The Continental features global cuisine and fabulous tiki-inspired cocktails. The Dragonfruit Mule’s bright fuchsia color works beautifully in the mid-century modern setting. Try the original at The Continental Miami. Build ingredients over crushed ice in a copper mug; Topped off with sparkling sake. A Peruvian twist on the mule crafted by skilled mixologist Joel Mesa. Try the original at Pisco y Nazca. Bulla Gastrobar’s mule is a fresh version on a classic. Try the original at Bulla Gastrobar. Into rum and over vodka? Or simply looking for a twist on a regular Moscow Mule? Opt for Rum Ambassador Isaac Grillo’s “Briland Buck” with an Asian twist at Repour or AFROHEAD Rum. Instructions: Build all ingredients over crushed ice in a copper mug; garnish with a lemongrass straw. Experience the Moscow Mule with an authentic taste of Mexico from Rocco’s Tacos. Komodo’s hand-crafted cocktail takes the Moscow Mule to the next level with its distinct flavor. Combine these ingredients for a unique Asian twist on the traditional Moscow Mule from Sushi Garage. Method: Add all ingredients to a mixing glass and shake. Top with ginger beer. Which is your favorite? Tell us in the comments below! The best thing about having a destination wedding in Saint Simons Island or Jekyll Island is sharing a bit of this beautiful area with your guests. Many of our clients’ wedding guests come from large metropolises from all corners of the country, so taking a piece of the South home is a welcomed gift. We’ve fallen in love with Low Country Luxe– a boutique operation that produces Southern inspired fragrances. Hand-poured, conceptualized and created in their Southern Fragrance House, Low Country Luxe’s Signature Collection features Gullah, High Cotton, Live Oak, Moonshine, Sea Grass and Spanish Moss. The two new fragrances are Moonshine and Live Oak. The Belle of the Ball Collection was added to the 2014 product line– with the inspiration for the collection being the candle developed exclusively for the 2013 White House First Lady’s Luncheon. With candles in several sizes and reed diffusers, these are the perfect gifts for bridesmaids, mothers or any one who loves the South! 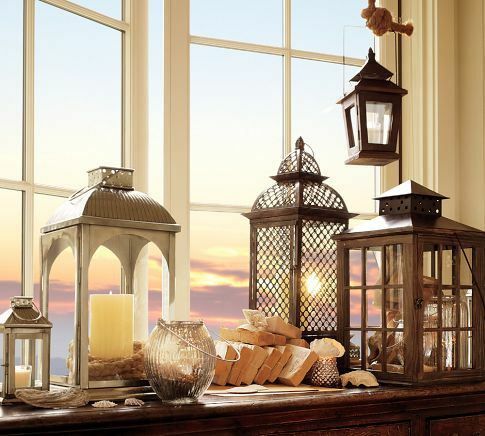 Learn more about Low Country Luxe at their website and see their inspiration on Instagram. Fall is my absolute, hands-down, favorite time of year. 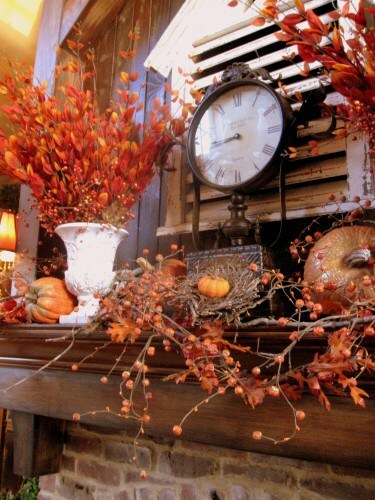 Notwithstanding that my birthday month is snugly nestled into this time of year, It’s just something about the change in colors, temperature and scents that does something to me every time. 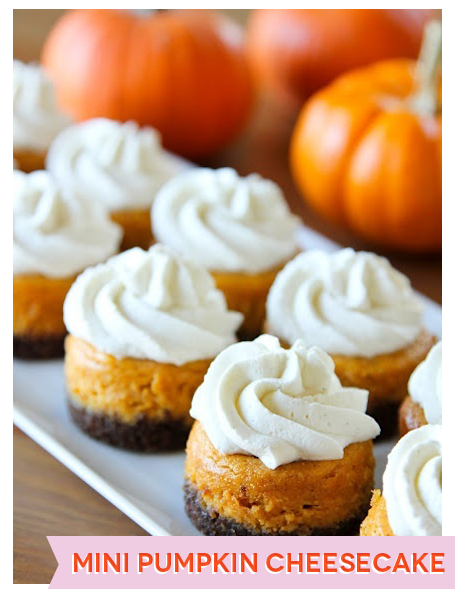 With Autumn quickly approaching, I anticipate there will be a get-together or two in our home, and I’d love to share some ideas with you. 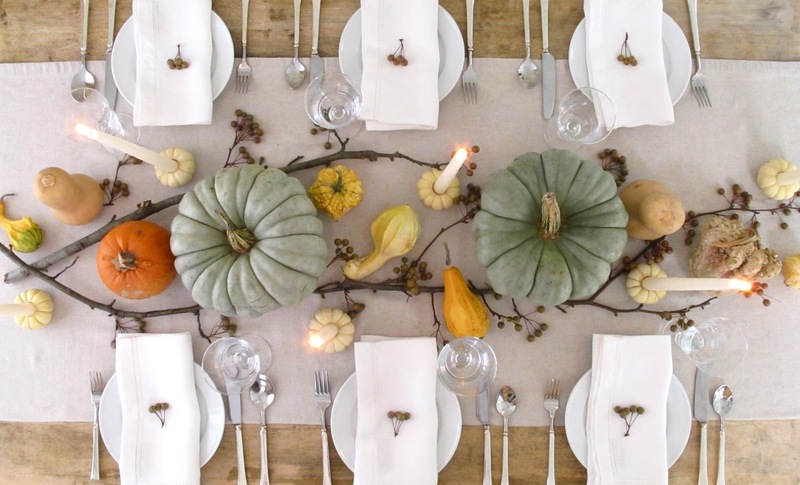 Love this set up from Everyday Occasions using seasonal gourds and pumpkins. 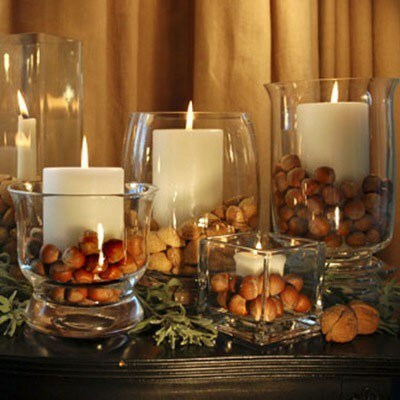 Love the pumpkin candle holders (tutorial on how to make them are at the link)! Now you know I’m all about a good drink, honey. 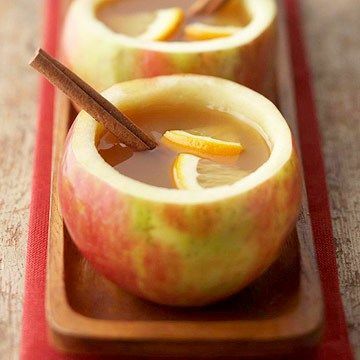 Which one of your guests do you think could NOT fall in love with being welcomed by these cored and cut apples filled with aromatic apple cider, with a cinnamon and orange garnish? If you can think of one, unfriend them now. 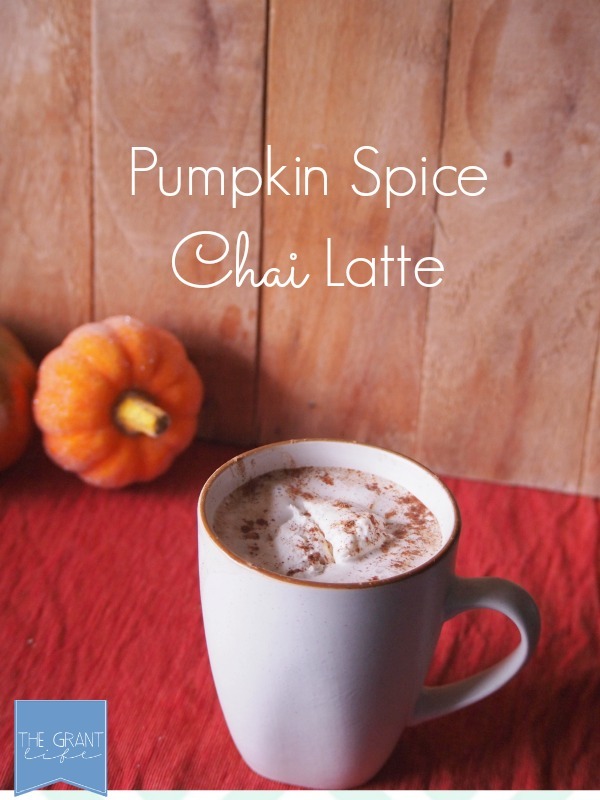 As the cooler weather creeps in, this would be a welcome and impressive treat. If your cider needs a little kick, add brandy and a smile. 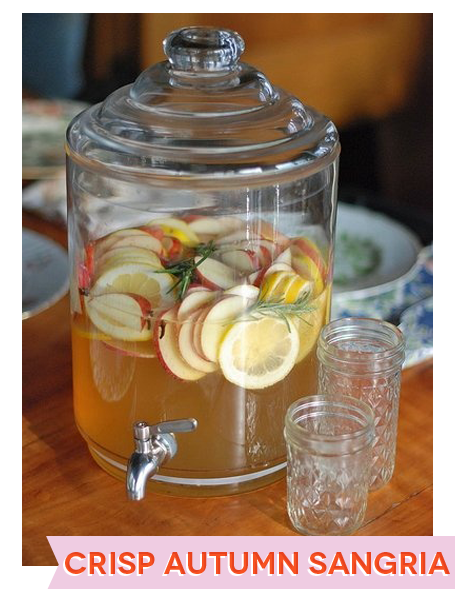 And what about this Crisp Autumn Sangria? YES! And what about food? 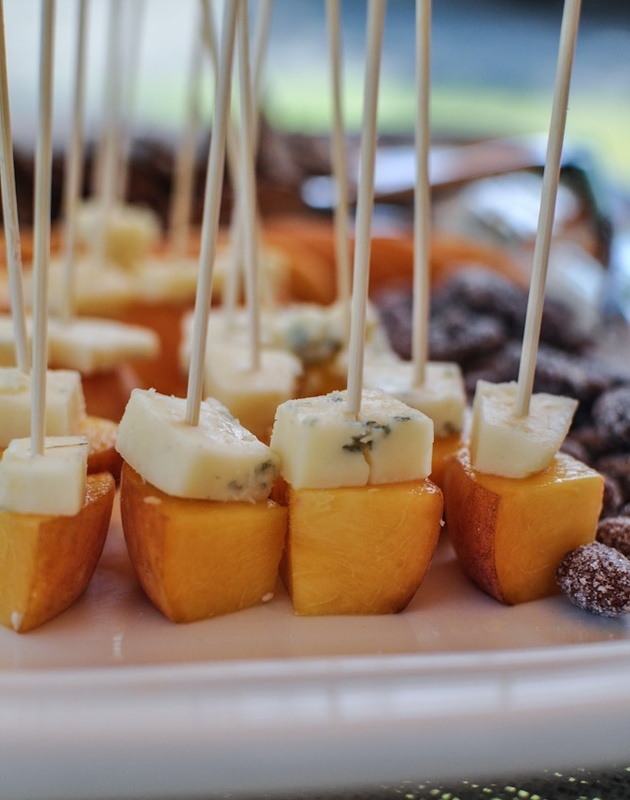 Youc could opt for a little sweet and savory with these pears and gorgonzola bites. Well, you know you also have to have a hearty stew or soup, right? 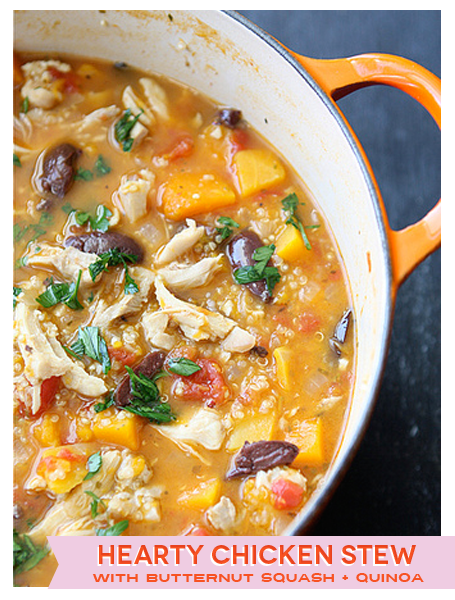 How about this Hearty Chicken Stew with Butternut Squash and Quinoa. Got a sweet tooth? 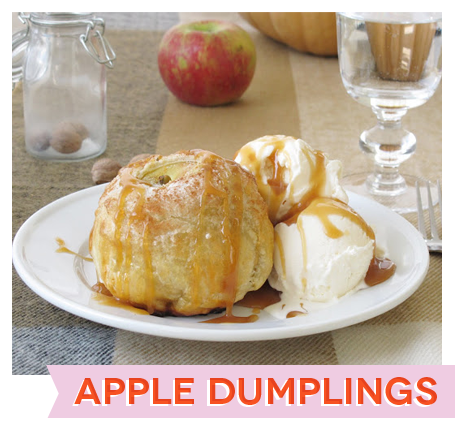 Pumpkin Cheesecakes or Apple Dumplings will be the cure of exactly what ails you.